It seems like ages since Amazon introduced us to the $199 Fire at a hectic New York City event, but in truth that was only about six weeks ago. Maybe our perception of time is warped because we've been hearing talk about this 7-inch Android tablet for months now. Maybe it's because Amazon launching a tablet seemed like such a natural thing to do after Barnes & Noble paved the way with its Nook Color. 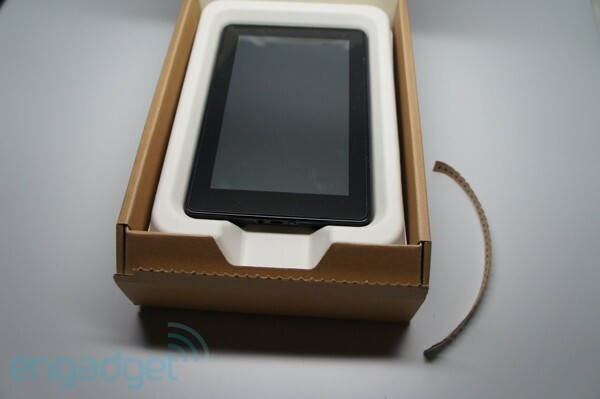 Or, maybe it's just because the gadget Amazon shipped looks nigh-identical to the 7-inch BlackBerry PlayBook that we've had for, well, ages. For whatever the reason, what Amazon has delivered is a device that is intimately familiar yet mysterious -- a simple, minimalistic exterior design hiding a flashy, seemingly quite trick customization that's sitting atop a decidedly ho-hum Android Gingerbread build. Our questions leading up to this review were many: How will it handle sideloading? Are the battery life and performance better than the PlayBook? 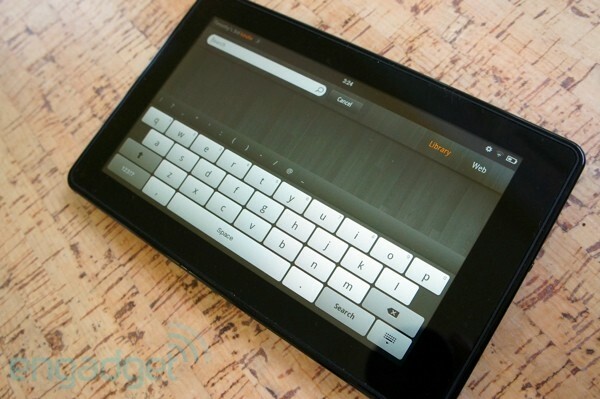 Can a tablet that costs two hundred bucks stand a chance against those that cost two and three times as much? C'mon baby, click on through to find out. 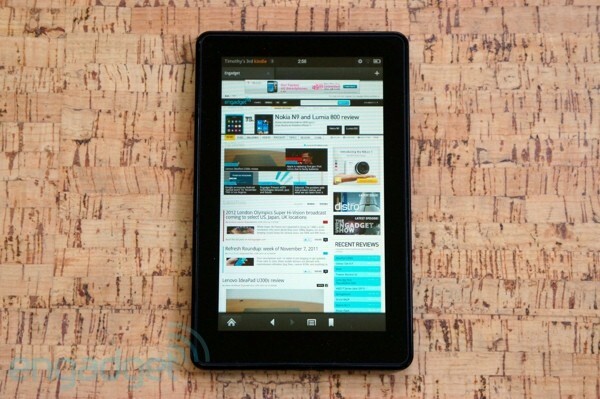 Amazon's first tablet can't quite match the experience of the competition, but for half the price it doesn't have to. 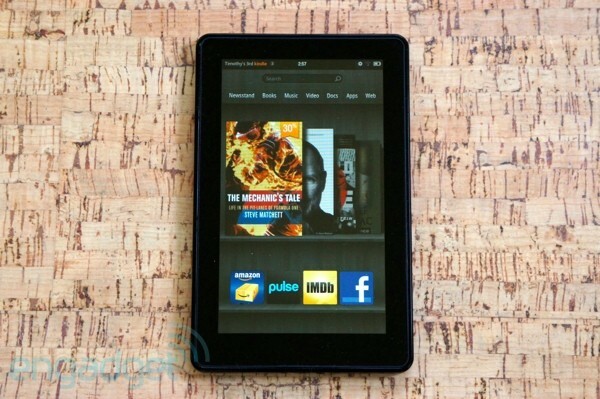 How would you rate the Kindle Fire? 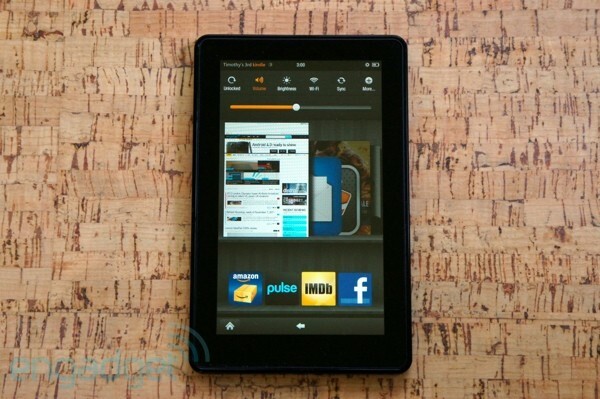 The Kindle Fire is not identical to the PlayBook on the outside, but it's pretty damned close. Turn off the screens then put a little black tape over the BlackBerry logo on RIM's slate and, at a glance, there's almost nothing between them. The Fire is a simple, black thing with nothing in the way of styling pretenses. In fact, one could say it has nothing in the way of styling whatsoever. Flip it over and you'll see the word "kindle" subtly embossed across the back, only really visible if you hold the tablet at an angle in some light. Otherwise the matte, rubberized back absorbs too much and you can't spot that one bit of styling indulgence the designers allowed themselves here. There's an extremely subtle "Amazon" print below too and, beyond some scribbles from the FCC, that's it. Pretentious this isn't, and neither is it a handful. Measured in inches it comes in at 7.5 x 4.7 x .47 (that's 190 x 120 x 11.4mm), making it 0.4 inches shorter, 0.1 inches narrower and 0.07 inches thicker than the PlayBook. At 413g (14.6oz) it's slightly lighter, too, but still far from a featherweight -- it's noticeably heavier than the 345g Galaxy Tab 7.0 Plus. This thing feels incredibly solid, as if Amazon simply put a chisel to a big piece of slate, gave it a good whack and then put the resulting slab into a Frustration-Free box. But, for that extra heft you get an extra feeling of quality. Like the PlayBook, this thing feels incredibly solid, as if Amazon simply put a chisel to a big piece of slate, gave it a good whack and then put the resulting slab into a Frustration-Free box. The rubberized back may not look or feel particularly posh, but the entire assembly is reassuringly stout. The slight step down in size here compared to the PlayBook comes at the expense of the bezels, which are slightly more trim on the Fire -- at least on three sides. 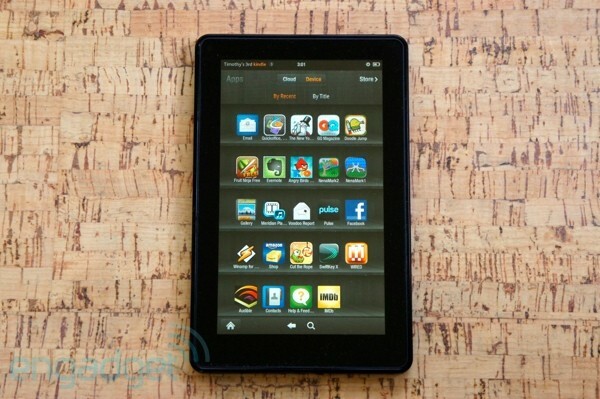 Held in portrait, the 7-inch, 1,024 x 600 IPS LCD is shifted ever so slightly toward the top. The slimmed-down black bars make no room for a front-facing camera and there are none to be found around back. So, while you won't be buying one of these for its looks, neither does it care much about yours. That non-removable, soft-touch back extends about two-thirds of the way up the edges of the device, the rest covered by shiny black plastic that flows up and around to the edge of the Gorilla Glass. Situated between those two layers are a pair of thin speakers that will send tinny, hollow audio out only on the right side when you're holding this as you would watching a movie. Those with more than one ear will want to want to make use of some headphones, which are not included. Bring your own and you'll find their receptacle on the opposite side, where the 3.5mm audio output is located. 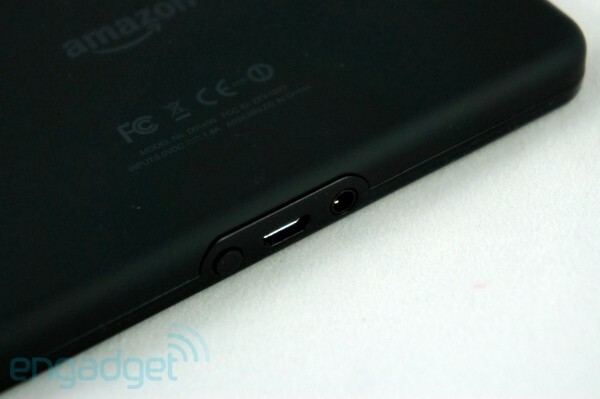 That's situated immediately next to a micro-USB port and a small power button. And that's it. There's just that one button to be found, meaning you'll have to delve into the software whenever you want to adjust volume. There's also no HDMI output for playing all of the great content Amazon throws your way and seemingly no ambient light sensor, as the tablet can't auto-dim its screen. If you're the type who likes to load down your tablet before spending a few hours or days offline, you might find this single, tiny capacity a bit restrictive. Things are similarly barren on the inside. It's the same dual-core 1GHz TI OMAP processor that powers the PlayBook, but here it's paired with only 512MB of RAM and a mere 8GB of storage, of which about six and a half will be available to you and your ever-growing multimedia collection. Ostensibly, you won't need much since Amazon so thoughtfully lets you re-download anything you've bought any time you want, and is quite happy to stream all your music to you as well. But, if you're the type who likes to load down your tablet before spending a few hours or days offline, you might find this single, tiny capacity a bit restrictive. It's a shame Amazon doesn't offer a $250 16GB version, and a $300 32GB option too. If you are streaming content you'll be doing it over WiFi, as there's no 3G option yet. The tablet supports 802.11b/g/n on 2.4GHz and had no problem picking up and staying connected to wireless networks that weren't necessarily offering up full signal strength, but we kind of wish there were a 5GHz option. Bluetooth might have been nice, too. Again, this is a 1024 x 600 IPS LCD panel that measures 7-inches from one corner all the way over to the opposite one. 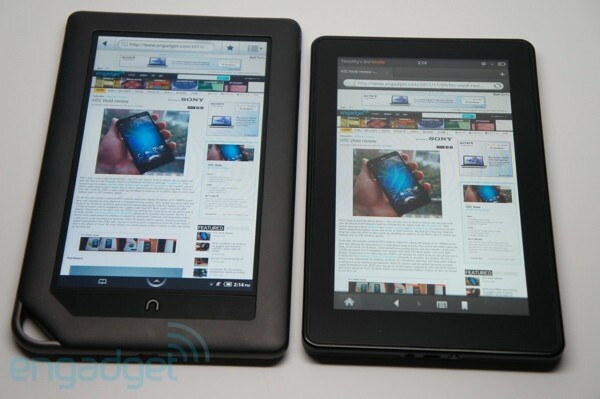 Those are the same specs as on the PlayBook and, as far as we can tell, this is the same panel. That's a reasonably good thing, because while it won't wow you at its maximum brightness, color reproduction is good and viewing angles are just as broad as you'd expect from an IPS panel. What isn't so impressive is the 169ppi pixel density. With more and more smartphones starting to offer 1280 x 800 resolutions in displays that are four and five inches we might have hoped for a bit more here. Suffice to say the LCD in the Fire is good -- but it stops short of being great. It's also a very, very different experience if you're coming from any of the company's other Kindles. E Ink displays offer a lower resolution and significantly reduced color depth (from this LCD's 16 million rainbow hues down to about 16 shades between black and white), but the Pearl display's reflective nature means it's just like reading paper and is very easy on the eyes. That is, of course, if you have enough light. An LCD brings its own backlight to the party, meaning you can easily read the Fire in pitch blackness if you're so inclined -- just remember you'll have to manually dial down the brightness before doing so. This is one area where the Fire can't hope to compete against its Kindle predecessors that got the market suitably warmed up. Those readers, with their power-sipping processors and incredibly efficient E Ink screens, have longevity measured in months. We sadly have to resort to measuring in hours and minutes here, but we still have reasonably good news to report. In our standard video rundown test the Fire managed seven hours and 42 minutes. That's 12 minutes more than the seven and a half hours Amazon promises it can deliver when playing video, reaffirming our belief that there is truth in advertising. Sometimes. That figure compares favorably to the roughly seven hours the PlayBook managed but comes in 27 minutes below the healthy eight hours and nine minutes eked out by the Galaxy Tab 7.0 Plus. As mentioned above, the Fire gets by with the same silicon that powered the PlayBook: a dual-core 1GHz TI OMAP chip, but here paired with only 512MB of RAM. Perhaps it's the step down from the standard 1GB, or perhaps it's the heavy-handed software overlay running atop Android, but the Fire never delivers smooth, seamless performance. While Amazon's own carousel of recently used items is slick and smooth, we had inconsistent results with APKs we sideloaded on here. While Amazon's own carousel of recently used items is slick and smooth, we had inconsistent results with APKs we sideloaded on here. Amazon's own media players work well, but third party ones that offered better compatibility with file formats universally did not. That said, 2D games like the omnipresent Angry Birds ran without issue, and simple 3D games like Fruit Ninja had no problems either. Given the Fire has no access to the Android Market many of our favorite benchmarks were unavailable to us. We were able to sideload Nenamark and Nenamark 2, but running the second caused the Fire to crash. Hard. After resetting the device (it takes just over 30 seconds to boot, for the record) we opted to stick with web-based benchmarks. Of those, the Fire achieved a respectable average score of 2,440 on SunSpider 9.1. Given the mysteries of Amazon's Silk browser, which offloads at least some of the rendering to the company's servers in the cloud, we're not 100 percent confident in that score -- especially since browser performance itself didn't wow us (more on that in a moment). But, as it's meant as a test of client-side rendering, it should be fair. You wouldn't know it, but the Fire is running Android 2.3 Gingerbread. That's the phone-friendly version of the OS that hasn't shown up in a top-tier tablet for quite some time. But don't fret that too much as it's been quite comprehensively buried here. So, let's start with what's been piled on. Your first experience with the Fire will be with a beautiful lock screen showing close-up imagery of abstract things -- heads on a typewriter, freshly sharpened pencils, well-used fountain pen nibs. Writers will feel inspired by these poignant pics but anyone who likes customizing their home screen won't. There are no widgets to trigger here, just a thin arrow that you must drag left to get in. It's situated too high, in the middle of the screen, making it a bit of a clumsy reach. Choose to lock your device with a numeric code and you'll be stuck with the even more unfortunate Gingerbread number pad, which doesn't scale well on a display this size. Unlocked, you're greeted with what Amazon calls the carousel. It's an endless stack of icons representing whatever you've most recently done -- apps you used, books you read, movies you viewed -- it's all here in a big pile. Drag your finger across and those icons flip aside much like Apple's iconic Cover Flow and this is, ultimately, an easy way to get back to where you were -- so long as wherever you were wasn't that far away. However, it quickly becomes a little too deep to be all that useful, especially if you're hopping back and forth between books and movies (as we reviewers are wont to do). The solution is to pull anything you like out and pin it to your favorites, which start occupying the shelves below this main carousel. This makes for easier access, but we wish we could split the carousel itself into multiple shelves -- separate stacks of icons for most recent books, most recent magazines, most recent movies, and so forth. You have to be annoyingly precise to get your chosen thing to launch. A bigger problem is the carousel being a bit too sensitive to touch. You swipe left or right through the carousel and then tap whatever you want to launch. But, if your finger moves even a pixel or two in any direction when tapping the chosen item won't launch. The list will instead scroll just a bit and then pop back. You have to be annoyingly precise to get your chosen thing to launch. Apps and content are co-mingled here and throughout the rest of the interface, categorized into the following sections: Newsstand, Books, Music, Video, Docs and Apps. Finally, there's the Web tab, which launches the Silk browser -- which we'll discuss below. You can guess what you'll find where, and the layout of each section is similar. Tap on Newsstand, for example, and you'll be presented with a list of all the magazines and newspapers you've purchased. On top is a toggle with two options: Cloud and Device. When "Cloud" is selected it shows all content you've purchased, whether it be online or off. Tap anything that hasn't been cached locally yet and it'll instantly start downloading. Switch over to "Device" and, surprise surprise, you'll find only the things that are actually on your Fire, presented in the same sort of bookshelf aesthetic that is continued throughout the interface. The more things you add, the taller your bookshelf gets. You can sort by recently viewed or by title, but you can't reorganize and put your favorite mags up to the top like you can on the home page. Up top, the screen is a simple notification bar showing your name on the left, the current time in the middle and, on the right, a gear, a WiFi signal indicator and a battery strength gauge. Tap on these and you'll get a quick slide-down set of toggles and sliders that let you enable or disable the rotation lock and WiFi, while also letting you adjust volume and screen brightness. Reminder: this is the only way to adjust volume on the device! You can sideload other keyboard apps without problem but, since you can't get to the Android setting where those keyboards are selected, you'll never be able to actually use them. Tap the "More" button and you'll get to the full list of settings, a rather comprehensive suite of toggles that's nearly as broad as the all those Android has to offer stock, but re-skinned and somewhat restricted. For example, you can sideload other keyboard apps without problem but, since you can't get to the Android setting where those keyboards are selected, you'll never be able to actually use them. Tap on the left side of the status bar (where it says your name) and you'll get a list of current things happening in the background -- downloads and installs and the like. If you're an Android user you might find it confusing that you can't simply swipe down from the top to get this list. You might also be lamenting the lack of buttons. Most apps on the Fire take up the full screen, hiding the notification bar. To get that back, and to display a little navigation bar on the bottom, you usually have to tap somewhere in the middle of the screen. That done, the navigation bar appears and you have access to the Home, Menu, Search and Back buttons. Sideloaded apps are much the same, except you need to tap on a skinny gray up-arrow on the bottom of the screen. The tap-tap-tapping to hide and display menus is all a bit clumsy and not particularly intuitive. We'd have preferred a nice set of gestures for navigation, as found on the PlayBook or TouchPad. Finally, there's no concept of task-switching here. Apps you've been using recently do remember their state and bring you back where you left them, but there's no way to, for example, do a long press of the home key and jump from one to the next. You'll always have to go back to that carousel and scroll your way through. Much has been made of the Fire's Silk browser and its remote rendering, ostensibly reducing the workload on the tablet itself and shuffling some of the heavy lifting off into the cloud to provide better, faster rendering. Does it work? Well, it's not the fastest browser in the West, but it is mighty quick given its limited internals. Stacked up against an iPad 2 the Fire routinely got beat in rendering pages -- but often not by much. 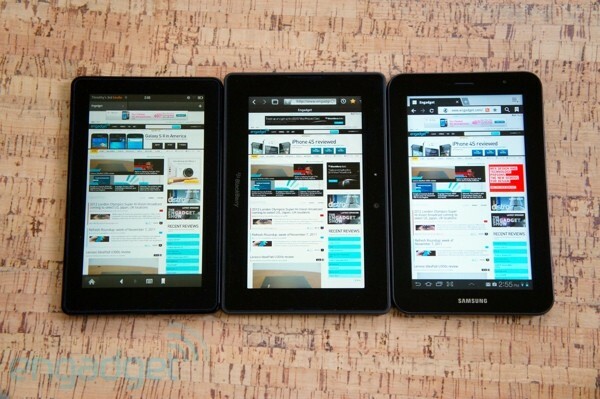 We also stacked it up against Samsung's Galaxy Tab 7.0 Plus, which was often slower. Finally, we couldn't resist pitting the Fire against the PlayBook, and we found those two to be neck-and-neck in most tests. It's not a bad performer, but Silk doesn't quite live up to its smooth name. So, the Fire is a fine rendering machine, not the fastest in the world but able to keep up with the best without any ugly dithering or visual artifacts to indicate the content's remote-rendered nature. However, if we move past pure rendering speed, interacting with pages definitely seemed occasionally sluggish. Pinch-zooming was a bit jumpy and scrolling somewhat laggy. It's not a bad performer, but Silk doesn't quite live up to its smooth name. In terms of interface, Silk is comfortable and intuitive enough. The address bar at the top disappears as you scroll down, but a simple tabs list is always present, enabling you to quickly jump from one to another. A simple bookmark button in the menu bar brings up a bookmark interface that's quite similar to the stock Android browser. A simple grid of pages representing your favorites, and just hit the big "+" on the one you'd like to add. Recently visited pages also show up in the carousel and, like anything else, can be added to your favorites for quick return viewing. Annoyingly, though, there's no way to add a page directly to your favorites from the browser itself. You need to browse to that page, exit to the home screen and then do it from there. A bit of a bother, that. 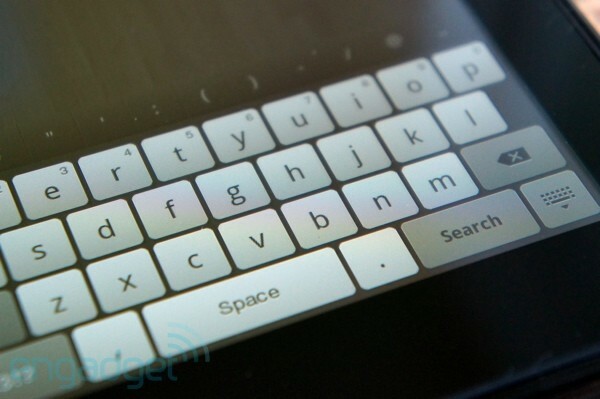 The Fire's stock keyboard is a relatively simple affair that offers suggestions as you type above the top list of keys. The suggestions are of course helpful, but the typing experience itself is a little cramped when the tablet is held in portrait mode. A particular annoyance is the spacebar on the keyboard, shifted off to the left thanks to an unfortunately placed period button. If you're the sort who exclusively hits the space bar with your right thumb you might find.yourself.typing.sentences.like.this. It's naturally a good bit more roomy when held in landscape, but even then the offset spacebar poses a bit of a challenge. If you can get over that it's a bit more comfortable to use than the stock Android keyboard, and the word suggestions are genuinely helpful -- especially for finding punctuation. There's nothing in the way of auto-correction, though, so if you want the suggestions to help you'll have to reach up and grab them yourselves. When you want to take things offline, with just a few taps you can download a song, an album or even an entire artist's worth of tracks. If you've been using Amazon's cold storage for your tunes you'll be presented with your entire library the moment you boot up your Fire. Of course, none of those tunes will actually be on your Fire, but you can quickly stream them at will. Streaming takes just a few seconds to start and, when you want to take things offline, with just a few taps you can download a song, an album or even an entire artist's worth of tracks. This makes it very easy to get your library where you want it. As with the other sections, purchasing music is very easy -- perhaps too easy for those whose buying impulses outweigh their budget-keeping abilities. There's a "Store" link that's always present in the upper-right, calling for you to click it should you find your Ryan Adams collection is a few discs short of comprehensive. 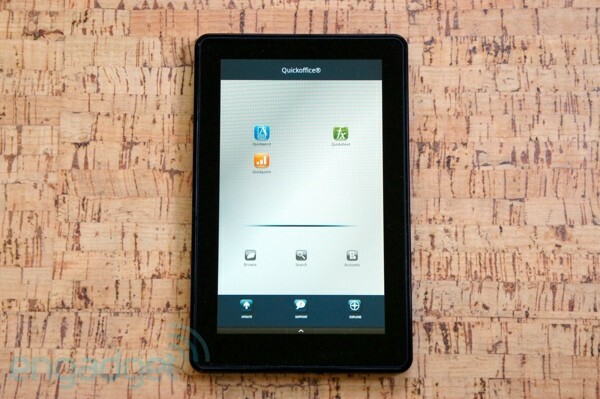 Purchases can be pushed to your tablet or your happy pocket of cloud storage and pricing is generally quite reasonable. The actual music playback is simple enough, with the album art taking up the left half of the screen and playback controls on the right. Thankfully there's a volume slider right here, but that won't do you much good if you need to tweak the volume when the screen is off. Audio quality through the integrated speakers is far from inspiring. Again, they're both placed on one side, so the resulting output is decidedly monotastic. Even at max volume the amplitude here is underwhelming. Sound quality is decent, but a bit hollow, as one might expect. Swapping over to your own 'buds or headset obviously helps, but we still weren't impressed by the audio fidelity. There's a very, very subtle pop when playback starts and something of a constant hiss in the background during playback, even when the music is paused. Audiophile quality this isn't. As with music, all your purchased or rented videos are easily visible, whether downloaded or not. If they're not, a quick tap brings them down -- but you won't want to ingest too many. After purchasing the two-hour Crazy, Stupid, Love (we're suckers for a sweet romcom) we found it to take 560MB of our Fire's storage. With about 6.5GB at your disposal you'll have room for 10 movies -- and then nothing else. Thankfully, though, you won't need to download them. With a quick tap you can stream your purchased content and save the local storage -- if you have a suitable connection. Whether downloaded or streamed the quality of the footage wasn't great, with plenty of compression noise providing muddying scenes with quick transitions. It didn't look bad, but those who've sworn off anything but Blu-ray and its sky-high bitrates won't go five minutes here without grimacing. Amazon of course also offers an ever-growing selection of streaming content for free through its Primed service. The offerings aren't quite up to par with what Netflix can serve you, but the assortment isn't far off. Sadly, though, none of this can be downloaded for later viewing and, should you find yourself pining for the library offered by another service, both Netflix and Hulu Plus will be available. Again, the presentation here is simple and the controls intuitive enough, naturally hidden most of the time during playback, but without HDMI output there's no way to get this video content onto a larger display. We asked Amazon if wireless video streaming might be in the cards, but the response is that instead the company would like you to try streaming your video content through any of a number of other devices that can pull Amazon content. So, here's to hoping you own one of those, too. Magazine reading is definitely a huge part of what Amazon's hoping people will love about the Fire, but our feelings here definitely fall more toward like. Amazon has lined up 400 full-color offerings for you to peruse, so chances are you'll find something that suits your fancy. We downloaded a few photo-heavy folios, like Esquire and House Beautiful, to sample the reading experience and in general found it to be good -- but not great. Here the 7-inch display becomes a bit of a problem, just feeling a little too small and not packing enough pixels to clearly render small text. We constantly found ourselves zooming in and out to read. You can switch over to Text View, which pulls all the text out into a much more enjoyable full-page view -- but then you lose all the beautiful formatting and presentation that make magazines so engaging in the first place. Amazon made a big deal about its partnership with graphic novel publishers for the launch of the Fire, and rightfully so. Comics have tried to go digital many times in the past and have yet to find a solid following -- at least among those willing to pay money for them. So, what's the reading experience like here on the Fire? Occasionally great, but it can't shake the occasional clumsiness that muddies things here. As with magazines, text is often squashed too small to be read -- even if its drawn in bold, sure penstrokes. Shockingly, though, you can't pinch-zoom to get a closer look! You have to double-tap on whatever section of the screen you want a closer look at. You then get a popup window with a closer view of that section and, from there, you can tap or swipe your way from one panel to the next. This is a little annoying if you just want to zoom in on one section and then zoom back out again, but it sure beats not being able to read the text. Other than that annoyance comics are a great addition. The Fire's screen does a great job recreating the bold colors and simple lines that make them such a joy to read. This is, of course, not just the Fire. 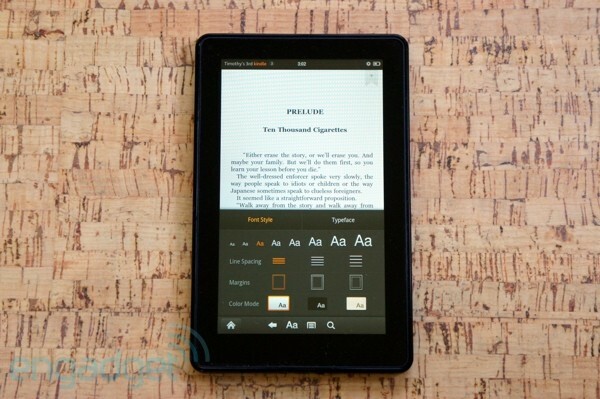 It is the Kindle Fire and, as such, reading is a big part of its game. You'll quite naturally have access to all the textual content you've purchased through Amazon in the past, all your bookmarks neatly synced here so you can pick up wherever you left off. Like with the other sections you can get a quick look at all your content available in cloud plus that which is already downloaded, and moving a book from one to the other takes just a tap. The Kindle store is of course also easily accessible, which enables you to download book samples if you're not quite sure if a certain writer's prose will please your palate. Also, Amazon has just started the Kindle Owners Lending Library for Prime subscribers, which lets them borrow one book a month for free. You have eight fonts to choose from in case the serifs on the stock typeface rub your Helvetic sensibilities the wrong way. The reading experience is about what you'd expect. By default you get black text on a white background, but if you find that a little too squint-inducing you can flip and get white text on black -- or even brown text on a yellow. You can dynamically change font size, line spacing and margins, and you have eight fonts to choose from in case the serifs on the stock typeface rub your Helvetic sensibilities the wrong way. To turn the page you either swipe your finger left or right or tap on the appropriate edge of the screen. Unfortunately, you can't tap on the bezel, a feature we'd have liked, and the new expanded tap zones in the Kindle Touch don't work here. With that device the "next" tapping region takes over much of the middle of the screen. Here that real estate is needed to bring up the menu. The Fire includes a version of Quickoffice out of the box, but it's capable only of reading Word-like, Excel-esque and PowerPoint-ish documents. If you want to edit or create you'll need to spring for the $14.99 Pro edition. There's a simple email app included here as well. It isn't nearly as good as Android's iconic Gmail app, but it does work well enough and will sync with your Gmail account without much bother. You are able to send messages with attachments, if you're so inclined. Sure, there are plenty of other 7-inch tablets out there, but at $200 it's hard to find a direct comparison. The best of the moment seems to be the Samsung Galaxy Tab 7.0 Plus, which we've been testing and generally liking. But, a starting MSRP of $400 makes that hard to compare -- even though it's thinner, lighter, faster and has full access to the Android Market. Another option is of course RIM's BlackBerry PlayBook, which at $349 is getting closer. In general we found the PlayBook to offer snappier performance, but that device hasn't exactly seen a flood of support lately and, while it is more feature-rich than the Fire, it has an even more limited app selection. The T-Mobile Springboard from Huawei is a compelling choice, a device that we surprised ourself by liking quite a bit in our recent review. It's running straight Honeycomb and is available for just $180 -- if you don't mind a two-year agreement. $430 off-contract is a bit harder to swallow. 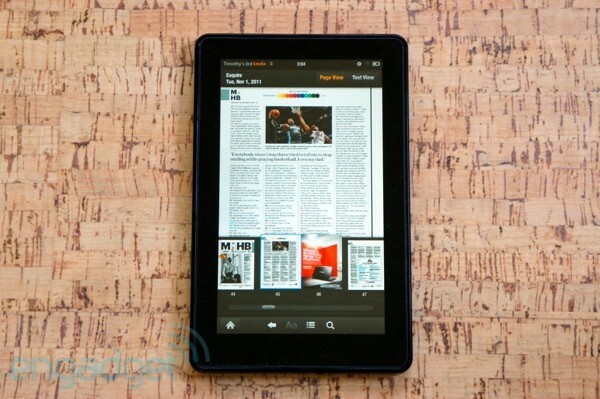 Of course, the biggest competition is yet to come: Barnes & Noble's Nook Tablet. That will cost $250 and ostensibly do much the same as Amazon's offering. How will they compare? We can't say for sure yet, but thankfully we also won't have to wait long to find out: the Nook Tablet ships on November 16th. 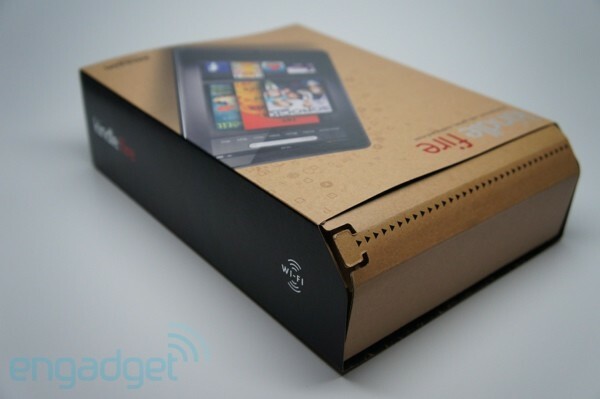 The Kindle Fire doesn't come with much in its Frustration-Free yet almost comically oversized box. 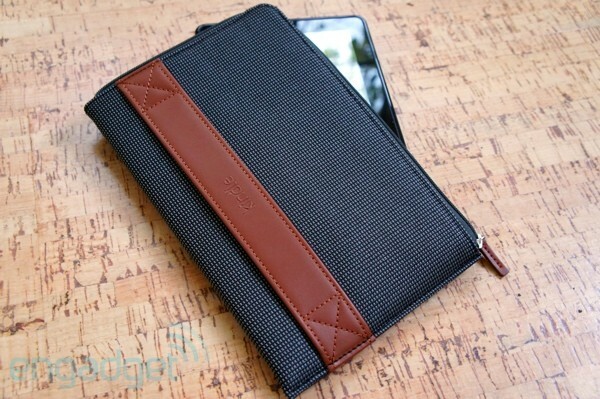 (It's larger than the container Samsung chose to hold the Galaxy Tab 10.1.) Inside you'll find a micro-USB power adapter for charging and... nothing else. No micro-USB data cable is provided and, while we're guessing you have one or two dozen to spare at this point, the Fire is targeting a whole new demographic of tablet buyers. We'd guess many of them don't have a single one. The assumption is that they'll just get all of their media through Amazon, and that's probably a safe one. Amazon offers a selection of cases and covers that range from simple cloth sleeves to rather more advanced (and expensive) Leather covers with integrated stands. We were provided with the $29.99 Zip Sleeve in Charcoal to try, which is simple and slim and does a good enough job protecting the stout slab within, but doesn't wow with functionality like Apple's SmartCover. If that one's not to your liking there are plenty more in various colors from various third parties -- most of which cost a good bit more. It's worth noting that none of these cases have integrated Bluetooth keyboards. That's not because these companies are assuming nobody would want to do that much typing on here anyway (again, probably a safe assumption), it's because, of course, the Fire doesn't offer Bluetooth in the first place. 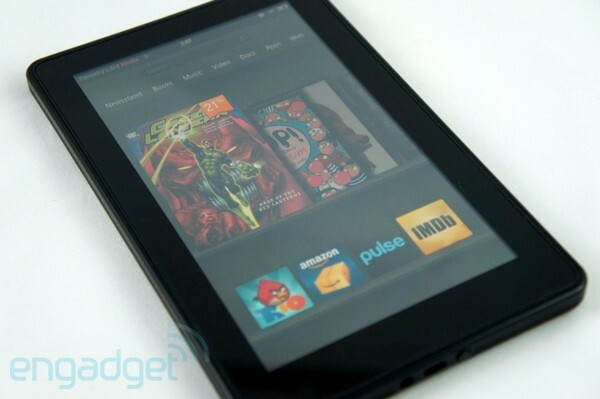 The Kindle Fire is quite an achievement at $200. 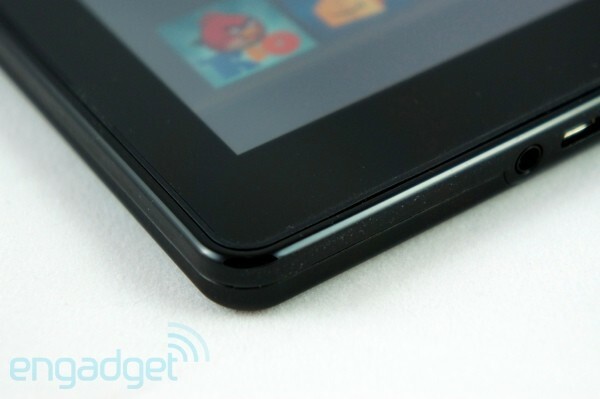 It's a perfectly usable tablet that feels good in the hand and has a respectably good looking display up front. Yes, power users will find themselves a little frustrated with what they can and can't do on the thing without access to the Android Market but, in these carefree days of cloud-based apps ruling the world, increasingly all you need is a good browser. That the Fire has. When stacked up against other popular tablets, the Fire can't compete. Its performance is a occasionally sluggish, its interface often clunky, its storage too slight, its functionality a bit restricted and its 7-inch screen too limiting if you were hoping to convert all your paper magazine subscriptions into the digital ones. Other, bigger tablets do it better -- usually at two or three times the cost. 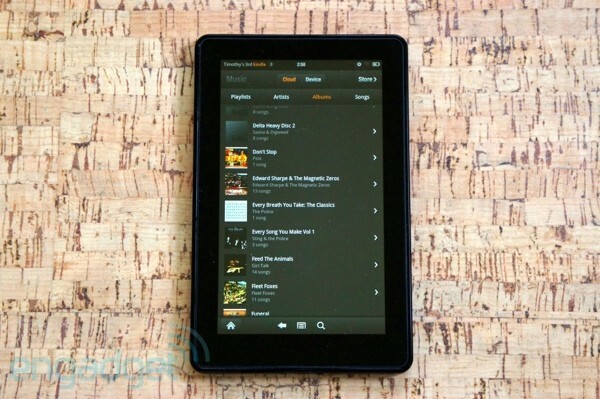 So, the Kindle Fire is great value and perhaps the best, tightest integration of digital content acquisition into a mobile device that we've yet seen. Instead of having a standalone shopping app the entire tablet is a store -- a 7-inch window sold at a cut-rate price through which users can look onto a sea of premium content. It isn't a perfect experience, but if nothing else it's a promising look into the future of retail commerce. 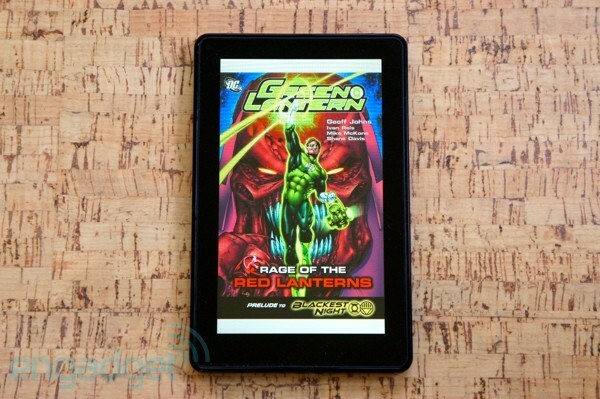 Update: Amazon wrote in to let us know that you don't have to double-tap on every panel when reading a comic. We've updated the text above to reflect that.